The warm look of gold and sparkling diamonds make these small 14K gold diamond vertical bar earrings from Apples of Gold Jewelry a pair of earrings that you will turn to again and again. These sophisticated bar earrings kick up your typical, plain bar earrings - each are covered with six small diamonds, for a total of twelve diamonds to add extra dazzle to your day. The earrings measure 8.8mm by 1.8mm in size, and have 1/10 carat total for diamonds (0.10 carats). They also have a friction push back closure design. These beautiful earrings are great when worn alone, or can add extra style if you have multiple ear piercings and want to combine them with others. 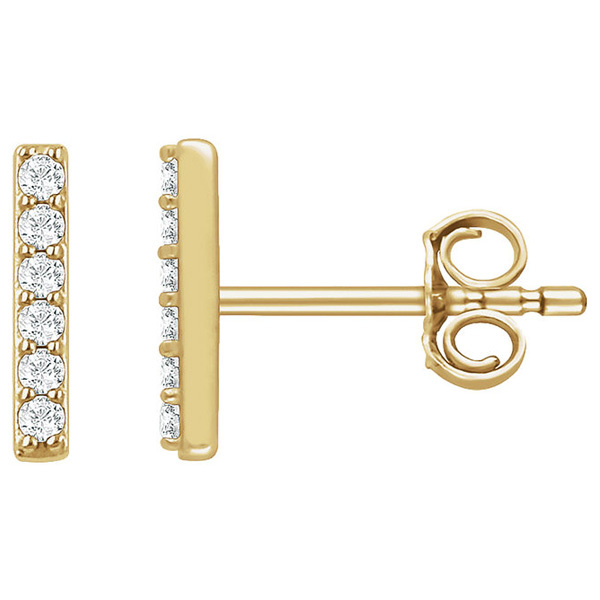 We guarantee our Small 14K Gold Diamond Vertical Bar Earrings to be high quality, authentic jewelry, as described above.